Pink streak and all. 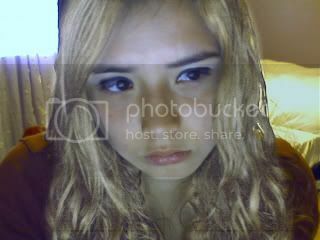 It’s definitely leaning more towards the platinum side, but I don’t much like “yellow” blondes. So, anyway… new layout soon. Very soon. This weekend soon. Why, yes, I am sick. Arghh! T_T;; My auntie had a cold and she got my little brother sick and now he got me sick. Whyyy? I hatehatehate being sick. Seriously. On Friday, Mom, Brother, and I drove to Santa Barbara for a tour of the UC campus. I fuhreaking loved it. The campus inspires me!! :] Good signs. Of course, I’m waiting on the status of all the other UC campuses, but I’ve already decided that if my some miracle I get accepted into UCLA, I don’t want to go there. ^_^ This is a very brave decision because clearly it’s the closest UC and the second best UC. :0 My Uncle Brian went to UCLA, but I don’t know… I want to leave my comfort zone and explore. Plus, the UCLA campus is way too small for all the students it has. I don’t want to be a grain of insignificant sand at that campus. Anyway, nothing much else to say… hm, except that I like some hip hop now. Haha, it’s the most unexpected thing ever. xD Oh yeah, and I love the show, The L Word. Sooo intriguing! I’m waiting for the postman to bring me letters. By BrigitteIn Life2 Comments on Siiiick. I got accepted to UC Santa Barbara!! :] I’m suddenly motivated again. All those years of school were definitely worth it. I loveee the campus!! However, I’m still wishing and hoping for UCLA. Eek!! Miracles happennnn. :0 lool. For AP English we’re currently reading 3 books and starting a new one on Monday (Catch-22) O_O; Haha… thank goodness I love to read, but it’s starting to seriously pile up!! Before Chapter 10 of AP Stats I was so sure I wanted to take the AP exam. Now I’m not so sure. I have until Wednesday to decide. I don’t even know if I’ll take the AP Econ exam. 😡 For sure, I’m taking both of the AP English exams. :] NO AP BIO EXAM FOR ME. I doubt anyyy one of us is taking that exam. Ackk. Not much else to say, so I’ll be off to do something else. Ah, okay so I made a new layout rather quickly. There’s nothing special to this layout except that floats do not work in the content of my entries. It’s upsetting, but I’m getting over it. The only special thing about this layout is that it flows to the image. Nice little technique I learned rather quickly the day I made this and coded it. Nothing nothing. Nothing has really been going on. Hm, I really like Raymond Carver’s short stories. I’m emotionally distraught indeed. Gimme pills of some kind. asdflsaklfssf. ♪ been looking forward to the future, but my eyesight is going bad. I can’t even picture my future anymore. I have no will left to live. I just want to give up. I can barely even get up in the morning and attend school. 2-3 days out of the week I only go to half of my classes for the day. My drive is burnt; I’m just so exhausted of life. Everything’s gonna be fine. Right? I CAN’T FIND A WAY TO LIVE IN THIS LIFE! By Scary Kids Scaring Kids. By the WONDERFUL Bayside (my fave band). Well, I’m not kidding anyone. I just want it to end. There’s nothing left to live for. I have no goals, nothing planned. And the phone, it rings without a pulse.